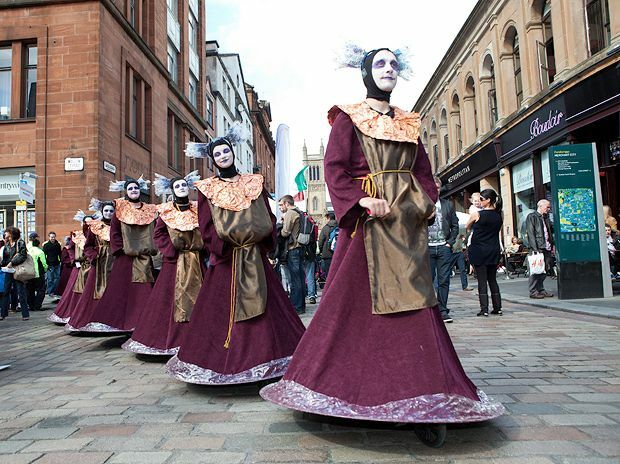 This year’s SURGE festival brings an exciting strand of Catalonian street theatre to Glasgow. Over the last weekend of July, five shows by acclaimed Catalan theatre groups will make their way through the Merchant City. One of them is Kamchatka, in which a group of migrants respond to the new world around them. Acclaimed Fadunito also present slapstick comedy The Grand Family; Ceci 3.0, which questions attitudes towards disability by inviting onlookers to sit in a remote-controlled wheelchair; and Externet, an installation about communication devised with community volunteers. Together with a new show from The Wandering Orquestra, Richardson hopes SURGE’s Catalonian programme will help introduce high quality street theatre to modern audiences and theatre-makers in Scotland. Who are the mysterious characters who all move as one? An improvisation show dealing with the essence of theatre in public space. A project aimed at stirring children's interest in poetry, literature and other forms of communication. With a focus on modern media including mobile phones, blogging, Facebook and Twitter. A wheelchair, seemingly abandoned in the street, starts to move. A show to help demystify children's fears. Five musicians turn up in the wrong city to play a concert. Theatrical musical comedy for all ages. A family of giants rampage through the streets on speeding tricycles and a pram.